After its huge refurbishment in recent years, Byron Bay icon Raes on Wategos has emerged dreamier than ever. We check in to find out. That first glimpse of Wategos Beach, as you wind around the hill, is guaranteed to take your breath away. This perfectly quiet pocket of Byron Bay, with its sparkling turquoise waters and pretty beach houses tucked into the hills, is more beautiful than words can explain. The lighthouse pokes its head over one side of the hill, and the pandanus trees and surfers come into view as you pull up to the brilliantly fresh and white 1960s villa on the edge of this very idyllic beach. This is Rae’s. And from the moment you arrive, you can tell you are somewhere special. Raes on Wategos was not always a luxury boutique hotel. This dreamy white villa started life in the 1960s as a kiosk, and became a restaurant later on in the 1970s. 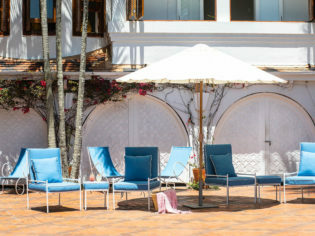 It was then in the early 1990s that the villa became a hotel – when taken over by entrepreneur Vinnie Rae – quickly becoming a Byron Bay institution, and one that was popular with Australian and international celebs alike. Most recently however (in 2014), it was the Catalano family of Melbourne who became the hotel’s new owners, and it is with thanks to them (and a whole host of other like-minded local creatives) that Raes has reopened with a very fresh new look and feel. Raes on Wategos was not always a luxury boutique hotel. This dreamy white villa started life in the 1960s as a kiosk. If it is not the super-warm and elegant general manager Francesca Webster who greets you on arrival, it will be one of her equally friendly team. Kitted out in their perfectly summery uniforms (designed by Melbourne’s uber-creative Lucy Folk), these kind hosts will offer you a welcome drink of Raes very own native iced tea (the flavour of which changes regularly, lemon myrtle on the day we visited) and a freshly prepared ‘Maca Cracker’ snack by chef Jason Barratt (with all ingredients in the snack being sourced from within 30 kilometres of Rae’s, including the ceramic dish itself), served to you at one of the outdoor bar tables. Feeling super chilled and relaxed, as you sit there sipping on your iced tea and staring out to the aquamarine waters in front of you, your kind host then runs through the bespoke itinerary that has been thoughtfully prepared ahead of your arrival – the staff’s favourite local walks, private beaches and waterfalls, and restaurants in the hinterland. It is the little touches like these that set Rae’s apart from others. Escorted to your luxuriously tranquil room (you have a villa, two penthouses and four luxury suites to choose from), your host gives you a quick run-down on all of the special little touches you will find inside – a decadent mini bar, a carefully curated selection of art and design books, Lucy Folk pretty-in-pink beach towels, Aesop skincare to name just a few. The interior design, by Melbourne’s Tamsin Johnson, is relaxed and understated. The original tiled floors have been resorted and bespoke pieces of art and furniture have been chosen to make your space feel more like a home than a hotel, offering a perfect (and indulgent) beach getaway. If expense is no object, we recommend booking Penthouse 1. It is an absolute dream. An elegant one-bedroom top floor penthouse apartment with expansive living areas and marble floors, featuring a king-size four-poster bed, sunken bath and a beautiful light-filled atrium overlooking the pool and lush tropical garden. The penthouse’s three large balconies offer ocean, headland and lighthouse views. Chef Jason Barratt moved up from Melbourne to join Raes late last year and comes from very good stock: ex Melbourne’s world-renowned Attica and Stokehouse. Barratt, humble and kind, says he is super excited about a sea change. He also has his hands full. The new Raes Dining Room is booked out (for both lunch and dinner service) for the entire summer. A pretty promising sign that Barratt is doing something right. Offering a small and perfectly curated menu, Barratt is all about contemporary Australian seasonal with a Mediterranean influence that showcases local and seasonal produce. He even forages some of the ingredients himself from around the nearby national park. We dined in the restaurant one evening (the spanner crab spaghetti with smoked tomatoes and sorrel, so perfectly summery), and had room service the other. I am not sure how you can make a baby gem lettuce taste so ridiculously intoxicating, but boy oh boy, Barratt can. Served with dill, pecorino and a macadamia cream, this was next level. The local sourdough with cultured butter is definitely also something to write home about! The dining space has been refreshed and is light and breezy, offering a relaxed yet elegant vibe. The interiors match the same pale blue and cream beachy colour palette of the staff uniforms, and the views out to the ocean are at once calming. Raes Cellar Bar is a new addition to the hotel since its reopening and is the perfect spot for a post-beach drink and snack. The old wine cellar was converted into a bar and seats spill out on to what was once the hotel’s carpark. Hidden away at the rear of the hotel, just by the sun-dappled swimming pool, the Raes Day Spa is an intimate and tranquil space designed to indulge guests with the highest quality treatments in an opulent and relaxing atmosphere. With a maple timber Vichy shower and spa treatments using Santa Maria Novella skincare products in one of their indulgent spa rooms, you are guaranteed to float out of here. The location (unbeatable). The restaurant (fresh, casual, delicious). Sunset drinks at the Cellar Bar. The chauffeur service. Kind and warm hosts. The staff uniforms (Lucy Folk you have done it again). And super friendly Michael on the Raes coffee Kombi van who pumps out fresh caffeine brews and toasties all day long – the perfect casual pit stop between swims. Rooms start from $650 per night. If budget isn’t an issue, we strongly recommend booking one of the penthouses (starting from $1350). You won’t regret it. Book ahead for your dining and spa treatments. Both fill up very quickly.